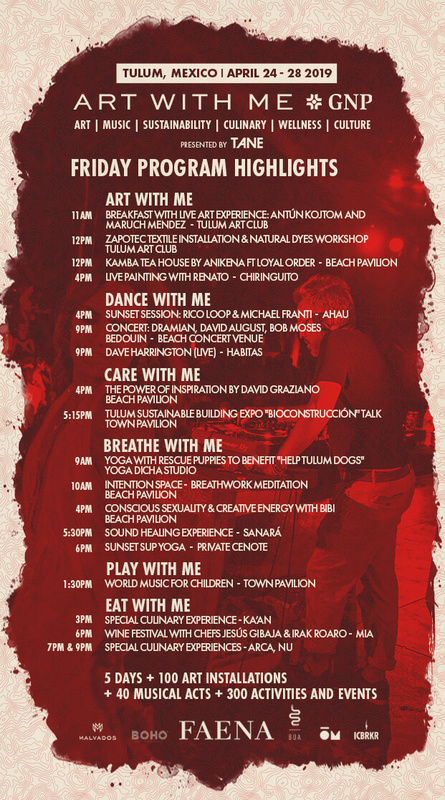 Art With Me *GNP is a community driven festival that combines art, music, talks and workshops, wellness and cultural experiences into a 5 night and 4 day journey to inspire change and personal growth. 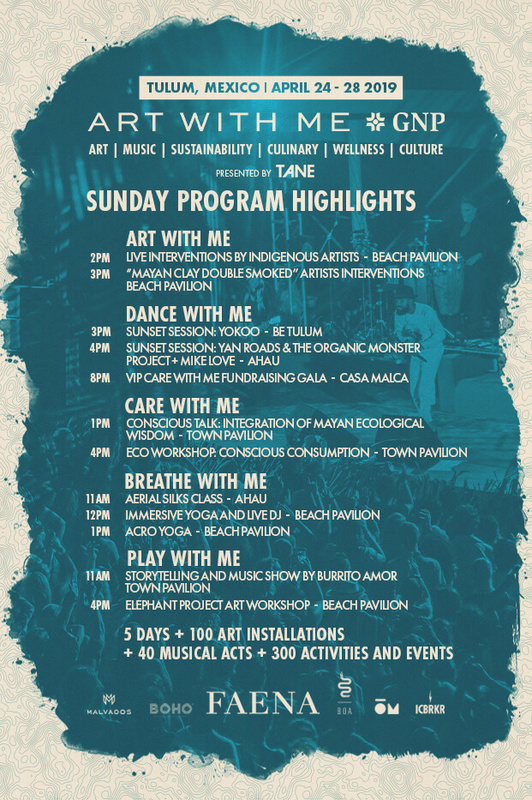 The festival features over 300 different events and activities taking place all over Tulum with art installations and unique workshops at partner hotels, sunset sessions, concerts and late night events at select locations on the beach, in town and in the jungle. Art With Me *GNP Pavilions feature activities for everyone including kids, an ArtBazar and more. Expand your awareness with Care With Me sustainability programming and enchanting art walks along the beaches and in the jungles of Tulum. 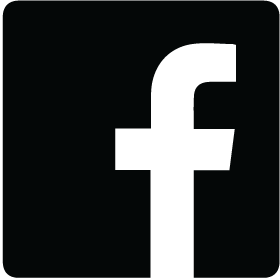 Constellation is a platform that invites the world to dream, connect and create. 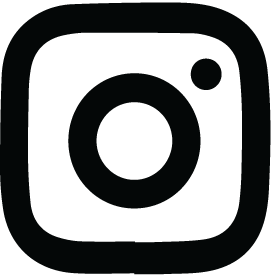 Through immersive installations, Dream With Me's mission is to create a dialogue between shared dreamers and connect them with social impact initiatives. 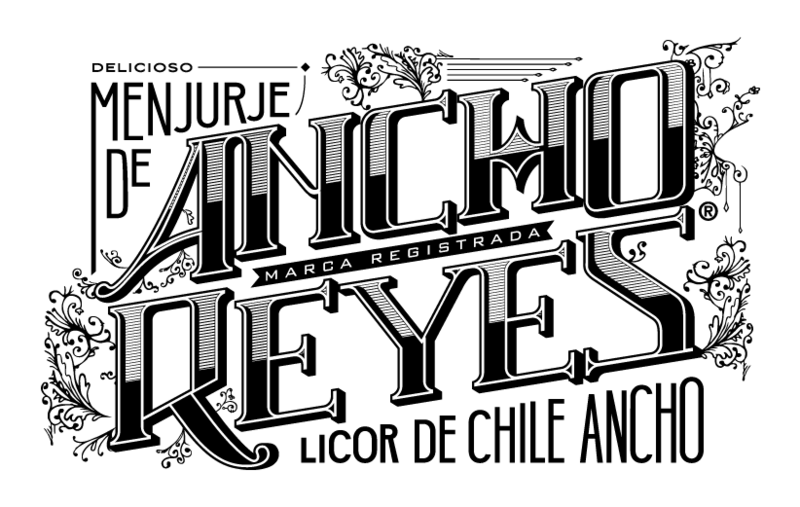 The project captures the collective voice of humanity through its dream expression. For Art with Me *GNP, Constellation will be creating the “Dream with Me” experience with renowned artist Okuda San Miguel. This dream portal will hold the dreams of Art with Me and will allow participants to reflect and share their dreams for a better world. Expect various dream activities around the portal , including a live concert, sound healing , a collective dream ceremony and workshops. 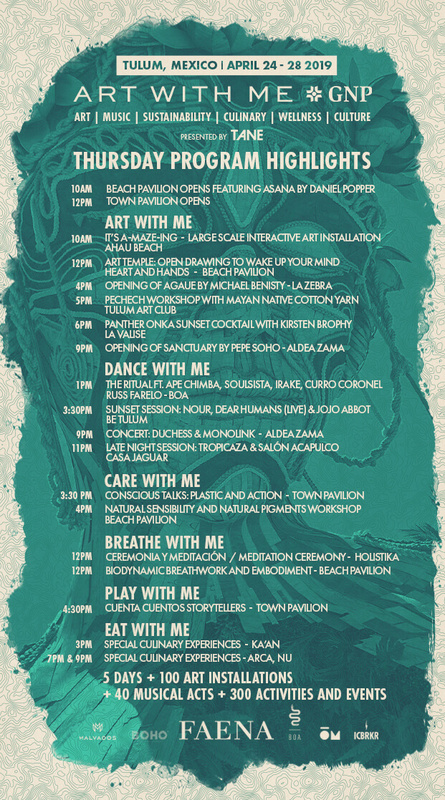 Inspiring talks, workshops, and interactive experiences focused around our core mission of bringing ecological awareness and sustainability to Tulum and the planet. Tulum is our home. We live here, work here and raise our families here. For the first time, Art With Me *GNP has united over 25 local businesses for a common cause: To bring awareness and solutions to the infrastructure and environmental challenges we face as a community. We hope to protect Tulum for many generations to come. We urge you to be a part of the solution by taking our Care With Me pledge. TALK "NATIONAL NETWORK ON SOLUTIONS TO PLASTIC"
TALK "KITCHEN OIL TO FUEL"
TALK "UNDERGROUND WATER YUCATAN AND CORAL REEFS"
Join nonprofit entrepreneur and meditation and yoga teacher Alhia Chacoff-Berger as she leads a short yet powerful meditation, to introduce an inspiring panel presentation of 2gether, and a provocative discussion on how to support the Tulum landscape and privately fund ecological solutions by leveraging local entertainment. Panel will be moderated by Jody Levy, co-founder of World Waters and Wtrmln Wtr and founder of Stitch Experience & Assembly, and will host surprise speakers. 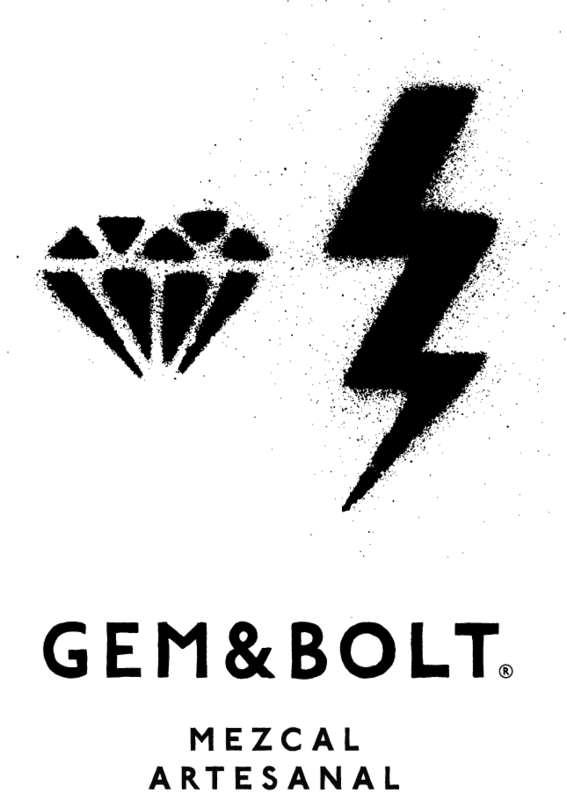 2gether is a new and innovative platform for social impact; it presents a sustainable, donation and fundraising free model for global change. Top Mexican chefs showcase their innovative menus, exclusive tastings and unique dining experiences at some of Tulum’s best restaurants and pop-ups hosted in our Beach, Jungle and Town Pavilions. Eat With Me dinning experiences are an additional cost and can be purchased on out ticketing page. Explore a robust wellness program including Mayan clay ceremonies, women’s and men's circles, plant medicine healing, cacao ceremonies, drum circles, Ayurveda workshop + tasting, ecstatic dance, yoga, Temazcal a traditional Mayan sweat lodge, and much more. Special events curated especially for kids and families, designed to inspire creativity and thoughtfulness in our future leaders. WORKSHOP DE BAILE PARA NIÑOS "PERSONAL FLOW"
WORKSHOP DE MUSICA "WORLD MUSIC FOR CHILDREN"
Free concerts, interactive experiences, talks and art designed to help spread awareness about our mission and support the local community in Tulum. 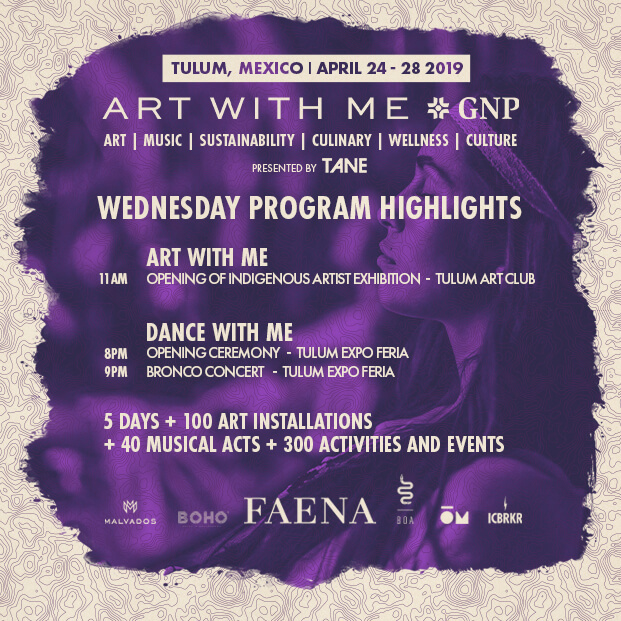 Come to the grand opening of the ART WITH ME * GNP festival where we want to gather the entire population of Tulum to dance to the legendary Bronco Group! This band that throughout 38 years of career has achieved sales that surpass 14 million albums and has knocked down the barriers that separate social classes, Bronco has conquered Mexico, The United States, Spain, Central and South America. Now Bronco travels to the south of Mexico to dance and celebrate another edition of this international festival that was born last year with the intention of bringing the most incredible art to Tulum, promoting creativity as a way of development. At 8 pm we will open with a Mayan blessing with the Grandfather Egilio Dzib Canul who will come from Cobá to ask permission to the 4 Directions to carry out the festival and that fulfills its mission to continue being a social and environmental exchange platform. 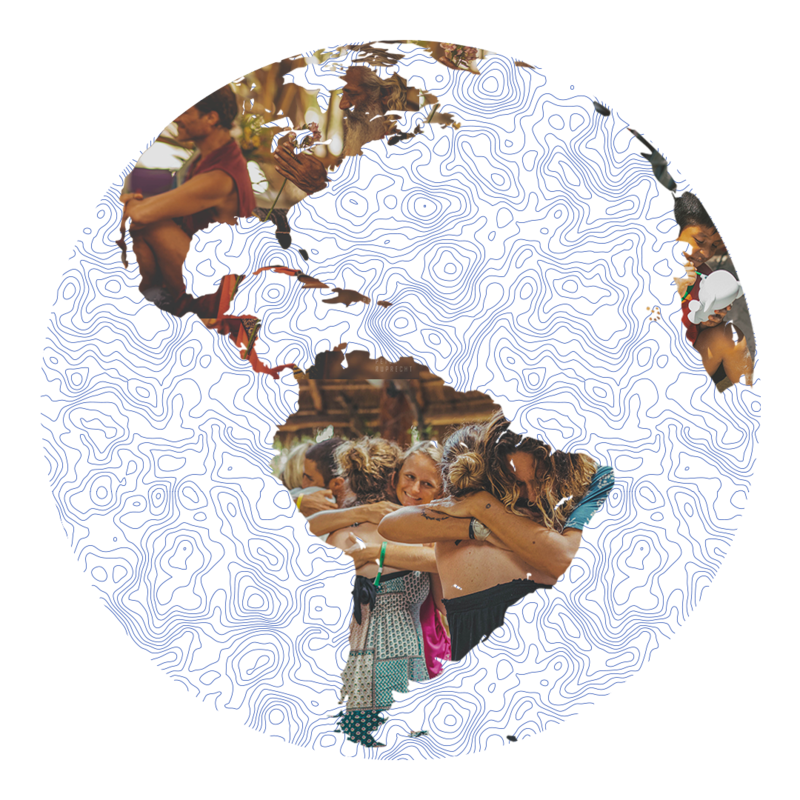 As part of ART WITH ME * GNP's commitment to help mitigate the damage to the environment, we invite the population to become aware of the problem of garbage that Tulum faces and the whole world. Today there is an overproduction of single-use plastics that have an excessively short life but nevertheless their existence lasts hundreds of years negatively impacting the environment. We want to encourage everyone to reduce the use of single-use plastics and to recycle them. For this reason we will be exchanging PET, Tetra Pack and aluminum packaging for tickets to the Bronco concert. 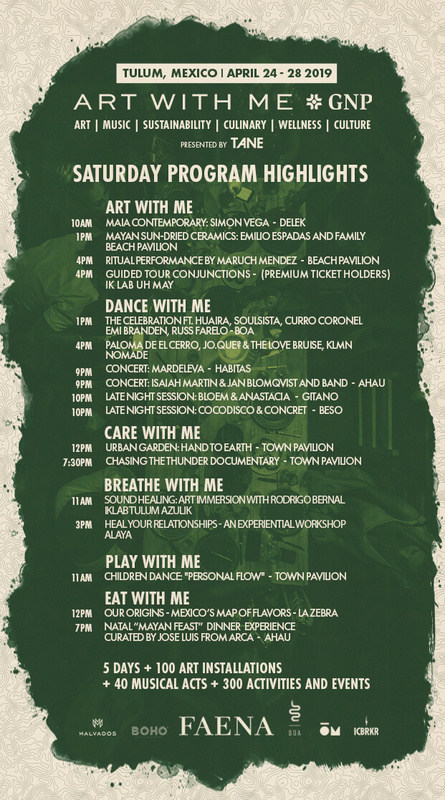 Bring 15 Recyclable (PET) plastic bottles, Tetra Paks, or aluminum cans to the Tulum Casa de la Cultura from 11:00 a.m. to 7:00 p.m. on Friday, Saturday, Sunday, Monday or Tuesday, April 19-23 for a ticket to the concert. Bring your separate waste on Friday 19, Monday 22 and Tuesday 23 April at the Casa de la Cultura de Tulum from 9 a.m. to 5 p.m for your free ticket. Thank you for joining our ecological mission and celebrating art and culture together! People living in Tulum and the surrounding areas qualify for USD $200 OFF 5 day festival tickets.